How to prevent your laptop from getting overheated ? A day back I went to my friends place where he was working with his laptop on the bed . When I tried to move my finger over the touchpad , I noticed that it's too hot [ not in sense of looks ] . This is not just my friends case , it happens with most of the laptop users that their laptops get overheated . Are you also feeling that your laptop is getting overheated easily ? Then you should try the following . Let your laptop breathe : Just like my friend , many of the laptop users keep the laptop usually on soft surface or on bed for their comfort. This is the first thing you should not do with your laptop as it blocks the airflow to the machine .Typically a laptop will have air vents in the bottom and on side or on the back . If you block them , the machine will get heated and if it crosses threshold , the machine will either restart or shutdown and may not start again . The threshold will be around 55 degrees Celsius . Don't place in the bag while its on : This also will cause overheating and may damage screen and keyboard . If your laptop constantly gets fried up , someday it will lead to damange of the main board . Let your laptop take a break : Don't use your laptop like a desktop . Once you feel that the keyboard and the area around it is getting heated up , give it a break . Keep giving constant breaks to your laptop . 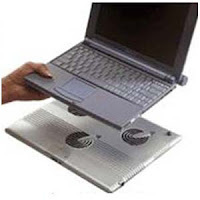 Buy a cooling pad : If you are really looking to use your laptop for longer intervals , you better buy a laptop cooling pad which according to amit Bhawani , are actually trays that contain extra blowers to allow more cool air to enter and push warm air out. These cooling fans are extremely cheap ( ranging at 600-1500 ) and while they may cause your laptop to look a little bit bulky, these will surely minimise the chances of getting overheated . Do you know any other way on How to prevent a laptop from getting overheated ? Let others know through your comment. Want to know How to disable touchpad in your laptop ? Go here .